Official US Military Surplus (R.A.C.K) MOLLE Radio Pocket / Utility Pouch. Condition is New. 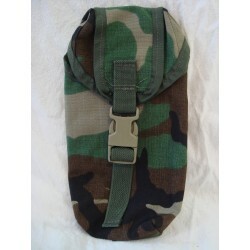 Official US Military Molle Radio Pocket Pouch. Made from heavy duty nylon material. Snap buckle closure. Can attach to the MOLLE system. Approximate size is 10" x 4" x 2" (L x W x H).